Over 32 years ago, ABC TV aired “Stars Salute Israel at 30,” which remains the only time that a foreign nation has been honored on US network TV on prime time. Here’s a clip from the show: Barbra Streisand (who since seems to have toned down her support for Israel, assuming it even exists any more) performing “Happy Days Are Here Again”, followed by a conversation with former PM of the State of Israel, Golda Meir, and then a rendition of Israel’s national anthem Hatikvah (The Hope). Golda was to die a few months later. Update: An interesting article on the special. 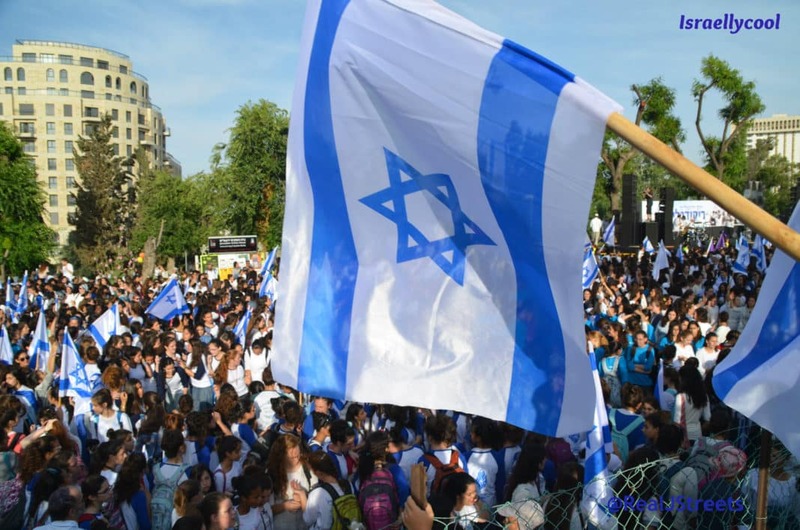 On May 13th, a marquee gathering began in Jerusalem to celebrate Israel’s sixtieth anniversary. Over three days, political leaders and writers including Henry Kissinger, Bernard Henri-Levi, Amos Oz, and President George W. Bush made speeches, and symposia on weighty topics, ranging from the scientific foundation of creation to the nature of Jewish identity, were held. Also this month, in New York and Los Angeles, live concerts featuring Matisyahu, David Broza, and Paul Shaffer marked the occasion. In Times Square, videos featuring stars such as Tom Cruise, Ben Stiller, and Dakota Fanning wishing Israel a happy birthday are appearing on two giant screens twice every hour. And on June 1, New York’s annual Salute to Israel parade will offer birthday wishes, as will yet another concert—this one on the Mall in Washington, D.C., hosted by Mandy Patinkin and featuring Regina Spektor. All this is well and good, but certainly a far cry from the thirtieth-anniversary celebration that ABC broadcast—in prime time—on Monday, May 8, 1978, and simulcast in Israel. The two-hour extravaganza, The Stars Salute Israel at 30, featured icons of the day: Mikhail Baryshnikov, Carol Burnett, Sammy Davis Jr., Kirk Douglas, Gene Kelly, Billie Jean King, Barry Manilow, Paul Newman, Bernadette Peters, and more. Sally Struthers of All in the Family cheerfully sang “Happy Birthday Israel” with a group of children. Henry Winkler, who played the Fonz on ABC’s number one sitcom, Happy Days, was paired with Henry Fonda in an unlikely skit: a sabra (Winkler) encountering an Old West cowboy (Fonda) in the desert. Yet this was mere prelude to the big finish: Barbra Streisand. With a big head of era-appropriate permed hair, she first sang three standards (“Tomorrow,” “People,” and “Happy Days Are Here Again”), then conducted a conversation via satellite with Israel’s former prime minister, Golda Meir, who appeared on a gigantic video screen, holding a clunky telephone receiver, gracefully answering Streisand’s fawning questions. (“How did you manage all these years to have so much energy? Did you take vitamins?”) After the chat came the pièce de résistance: Streisand singing “Hatikvah,” Israel’s national anthem. Introducing the song, whose title means “the hope,” Streisand said, “Let us light candles on both sides of the world in the hope that people everywhere will be inspired to work for peace and love and the betterment of all men.” Attendees in Los Angeles’s Dorothy Chandler Pavilion held aloft light sticks as their counterparts in Israel raised candles. No fewer than 18.7 million American households tuned in. Now Streisand’s performance is enjoying a second life: More than 366,000 people have watched it on YouTube since it was posted in 2006. Two months before the thirtieth anniversary, Israel had suffered its deadliest terrorist attack. Palestinian terrorists who came by boat from Lebanon killed thirty-five Israeli civilians. Israel responded by invading Lebanon, a weeklong incursion that ended when the United Nations Security Council mandated Israel’s withdrawal and the posting of UN troops. But this was also, as Streisand said, a historical moment of hope: six months earlier Sadat had traveled to Jerusalem, raising the possibility of lasting peace. And two years prior, Israel had succeeded in rescuing all but three of 105 hostages from a hijacked Air France plane in Entebbe, Uganda—a daring raid that became the subject of two made-for-TV movies, one of which appeared on ABC. The chief and founder of ABC, Leonard Goldenson, was an outspoken advocate of Israel (according to one account, when he showed up unannounced at Golda Meir’s doorstep in the 1960s, she thanked him for his devotion to the nation and invited him in), so it’s no surprise he greenlighted the thirtieth-anniversary spectacular. ABC also had a proclivity for quirky programming, like Battle of the Network Stars, the biannual special in which you could see, say, Scott Baio and Billy Crystal competing in an obstacle course race, with Howard Cosell announcing. No other Jewish American performer of the time was as big as Streisand. This was little more than a year after the release of A Star Is Born, which had garnered her an Oscar for the song “Evergreen.” Fishman enlisted producer James Lipton, now famous for Inside the Actors Studio, and director Marty Pasetta, another award-show veteran, and set to work getting Streisand. She was interested, but had her own conditions: She wanted to sing accompanied by Zubin Mehta and the Los Angeles Philharmonic. So that’s exactly what she got. And with the strength of Streisand’s name, Fishman and company sold the show to ABC. In the days before the show aired, Kohan and Mehta went to Streisand’s home to help her prepare. “She wanted to sing ‘Hatikvah,’ only she didn’t know” the song, Kohan recalls. Kohan picked up the phone, called his wife, Rhea, and asked her to sing the song to Streisand. “I hope she’s not intimidated,” Rhea quipped before launching into it.